It’s that time of year when everyone is getting sick, with the flu as one of the number one culprits. I don’t know about you, but when I’m sick I crave hot soup. 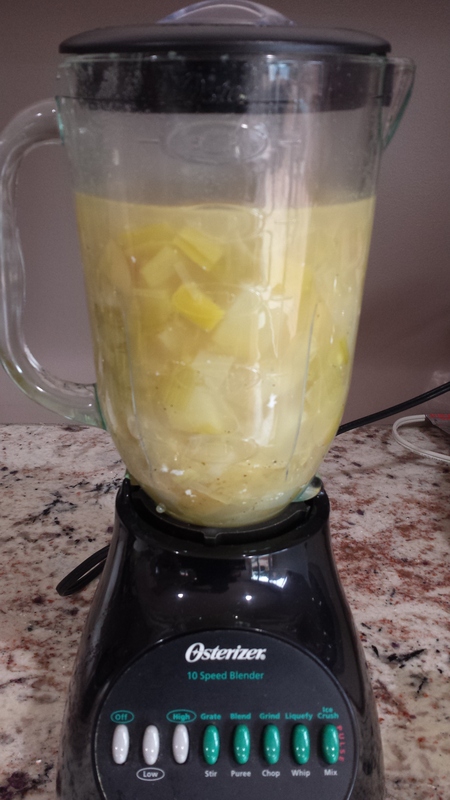 Lately, I’ve been craving potato and leek soup, so I thought it the perfect opportunity for this particular post. 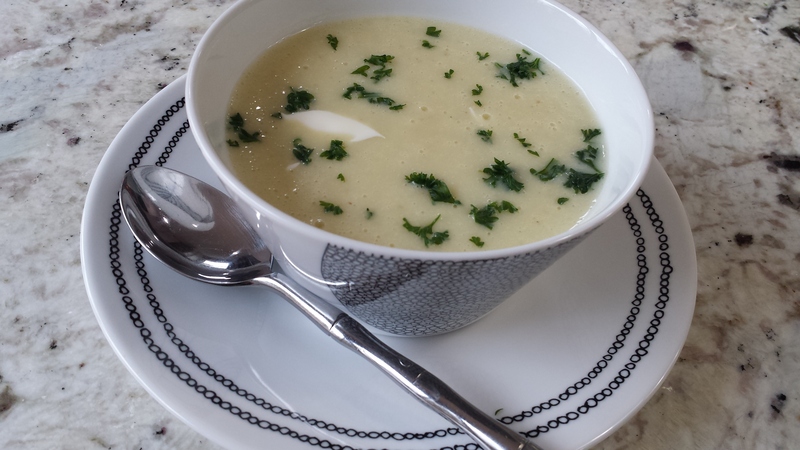 This soup is fairly easy to make, inexpensive to make, and low calorie to boot. Win win all around with this one 🙂 And gluten-free, and egg-free, and nut-free, and soy-free, could be dairy-free. Mind you, it is not at all taste free! 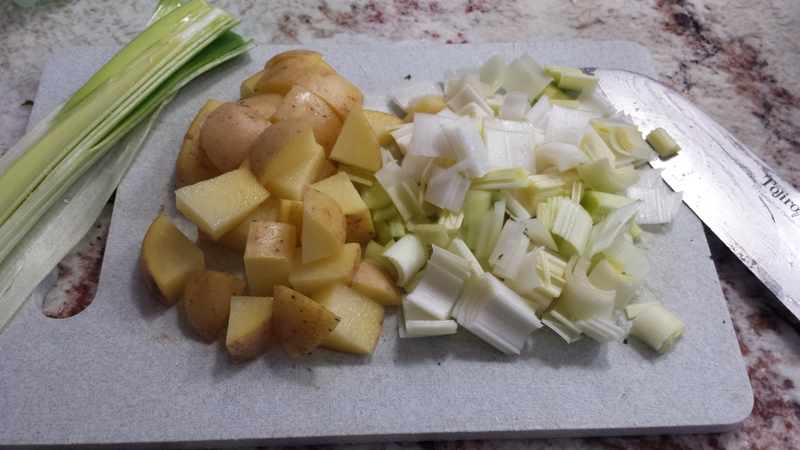 First, cut the ends off of the leek (or leeks, depending on size) and then cut the leeks lengthwise. Chop into 1/2″ pieces. Cut the potatoes into 1/2″ – 1″ pieces. In a large stockpot, add 2 T. olive oil. 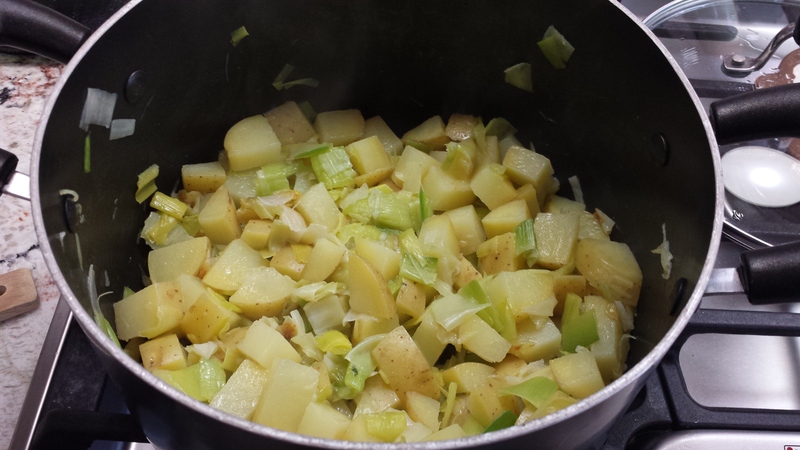 On medium heat, add the chopped leek and potatoes and cook until slightly browned and tender (approximately 10 minutes). Next, add the broth and bring to a boil. Once boiling, reduce the heat to a simmer. 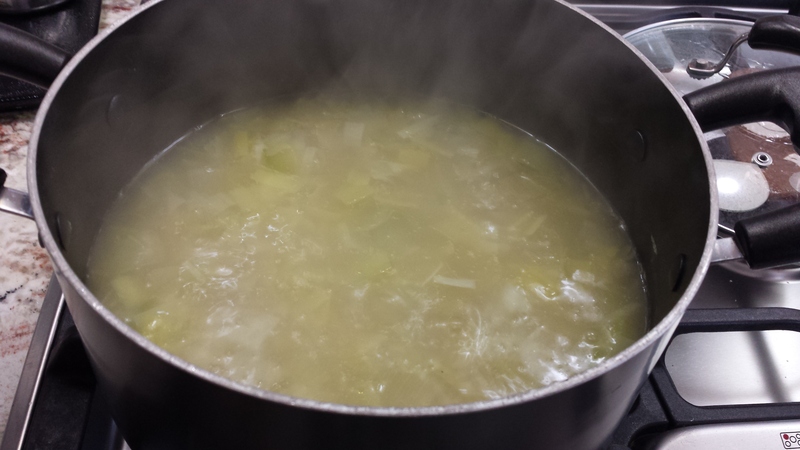 Simmer the leeks and potatoes in the broth until the vegetable are tender (about 30-40 minutes). The amount of time is really dependent on the surface area of the bottom of your pot and the size of your chopped vegetables. If you use a pot with a larger surface area, the cooking time will be reduced. If you cut your vegetables into larger pieces, your cooking time will be increased. For the next part, I used my blender. You can also use a food processor, or an immersion blender. 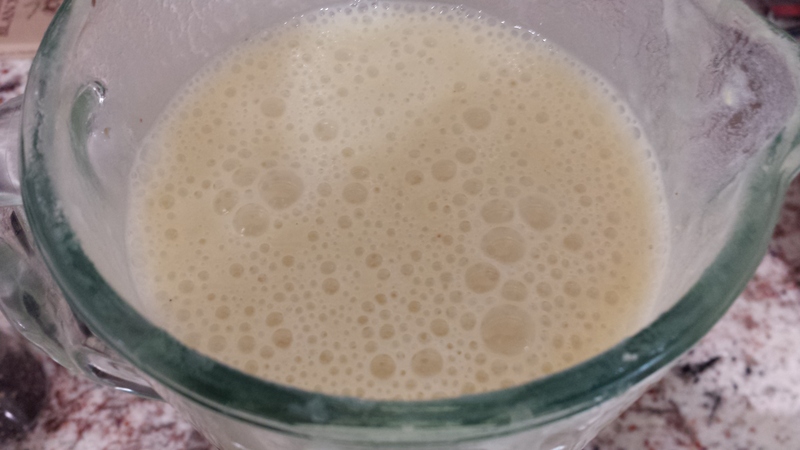 Since I used a blender, I prepared it in three parts (batches). For each batch, I added about 3-4 cups of the cooked vegetables and broth, one big dollop of the plain yogurt, 1/2-3/4 t. salt, a pinch of ground black pepper, and 1 t. lemon juice. Blend the mixture on high (blend) for 1 minute. The actual amount of time here is important. You want the texture to be super smooth and silky and at least one minute blending time is critical for that. My volume of liquid in the blender actually increased about 1 cup after blending, so don’t overfill. Combine all three batches (if you prepared it in batches) to ensure a uniform taste before portioning. Sprinkle with fresh, chopped parsley and a dollop of sour cream or creme fraiche before serving. P.S. This recipe is vegetarian (if you don’t use chicken stock). If you want to make a vegan version, use vegetable stock and feel free to use Tofutti or Follow Your Heart sour creams. You can also use these in place of the yogurt. 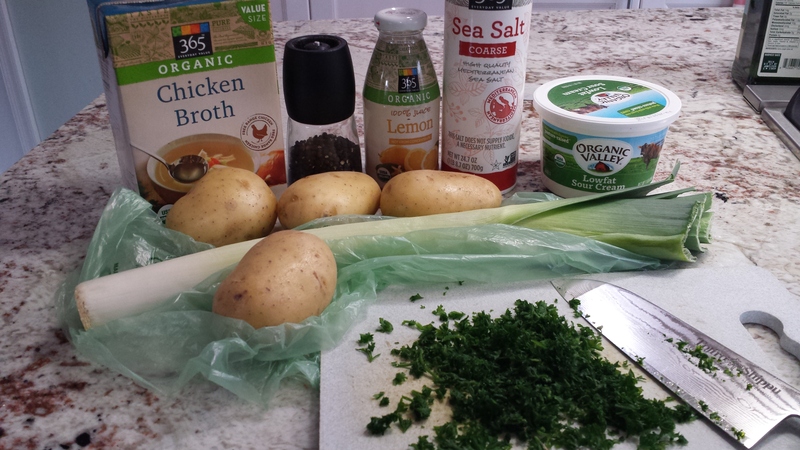 This entry was posted in appetizer, has dairy, soup, vegetables and tagged egg-free, gluten free, grain-free, leek, parsley, potato, soup, sour cream. Bookmark the permalink.